When a question is answered, the member who asked the question will receive a notification and will be prompted to indicate if the answer answered the question or not. 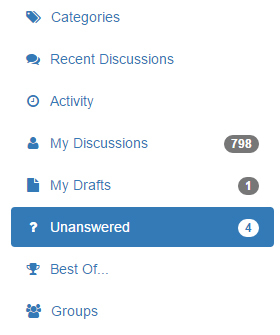 Valid answers are highlighted and displayed at the top of the discussion list. Members who answer questions will receive badges (if badges are turned on). A shortcut can be displayed in the side menu to show all unanswered questions. The Q&A addon can be enabled from the Dashboard on any plan level. You can find it in the list of addons by searching for Q&A. There is only one setting for the Q&A addon. You can decide if reputation points should be awarded to members for answering questions. Creating a question will create status labels in the discussion view. Users will receive pop up notifications when their questions have new comments, prompting them to mark a post as the solution. By default, the selected answer will be pulled out of the post order and pinned directly under the original post for easy access. This behavior can be modified with a support request, allowing the post to be duplicated instead of being completely reordered. Navigating to /discussions/unanswered will allow you to see all the questions that still need attention in your community. You can set the ability to create questions with category permissions. When creating or editing a category, check the option “This category has custom permissions.” This will reveal the “Discussion Type” options. You can choose to disable discussions in a category, which will change the “New Discussion” button into “Ask a Question” in that particular section. If you’d like for “Ask a Question” to be default forum wide, you can request for us to toggle the option through Support.